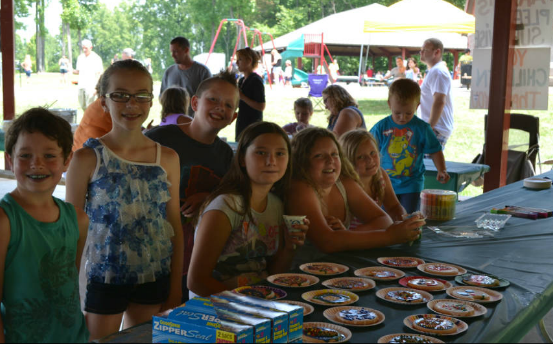 Employees and their families were treated to another sunny, summer celebration at the annual Compunetix, Compunetics, Chorus Call, and Sonexis picnic. Attendees enjoyed various activities and delicious picnic fare in the beautiful Monroeville Park. Adults participated in several games of horseshoes, a company picnic tradition. Volleyball as well as an impromptu game of badminton brought out the competitive side of many. But competition really got heated for the cookie contest. Prizes were awarded for the tastiest and most creative submissions. There was plenty of excitement for the kids, too. Not to be outdone by their parents, the children took great care to decorate their own cookies, and there were lots of happy faces as the young picnic goers rode ponies around the park. But, without a doubt, the hit of the day was the petting zoo. Children of all ages gathered to pet, feed and admire pigs, goats, sheep and a baby alpaca, donkey, cow, zebra and camel. To see photos of the picnic, click here for a slideshow! Many thanks go out to the dedicated volunteers who organized this annual family-friendly event!